The press conference for Dr. Chen Qi’s masterpiece entitled “The Greatest Virtue is Like Water” was held by The Trading Platform of Chinese Graphic Arts in the lobby of The International Copyright Exchange (ICE). The work is comprised of a total of ten editions with 50 impressions per series,which amounts to 500 pieces will be put on sale from February 1 through March 18 and they will come into circulation from March 25, 2013. Currently, Prof. Chen Qi (b. 1963) works and teaches at the Central Academy of Fine Arts. Also he is a member of Graphic Arts Commission, Chinese Artists Association and he serves as Secretary-general of Printmaking Institute, China National Academy of Painting. Chen Qi has bravely transformed and moved beyond modernism, incorporating the lighting ideas of Western paintings and expanding water-based printing beyond its original limitation to Chinese ink painting and modernist aesthetics since the very beginning of the ’85 New Wave. He explores water-based printing’s contemporary expressive abilities through independent artistic language. His work is described by the arts community “as minimalistic as poems, as ethereal as dreams”. Especially, his series of water was the most internationally recognized masterpiece which has been permanently collected by many prestigious institutions. 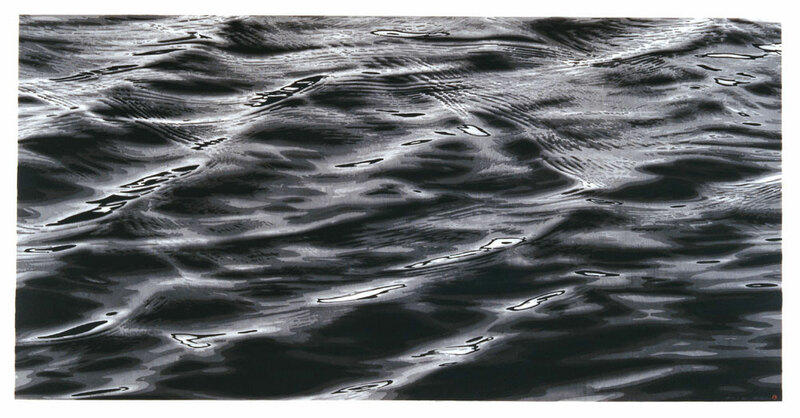 “The Greatest Virtue is Like Water” will be his final work themed on “water” which is of great value in collection. Red Gate Gallery presents Chen Linggang's solo exhibition "On Reading and Writing"